Hundreds of bats have died and a dog owner was charged with animal cruelty amid sweltering conditions in Australia, authorities say. Sydney experienced its hottest day since 1939 on Sunday when the mercury in the city's west hit 47.3C (117F). Bats, possums and birds have endured the most heat stress among native animals, according to wildlife workers. One woman left a puppy in a car that was found to have an internal temperature of 65C (149F), police said. Officers smashed the car's windows to retrieve the seven-week-old dog outside a shopping centre on Saturday. The puppy was given water and moved to an air-conditioned police car. The woman, 28, was charged with an animal cruelty offence. In the city's west, a colony of flying foxes - a species of bat - experienced severe heat stress. At least hundreds had died, said the New South Wales Wildlife Information, Rescue and Education Service (Wires). 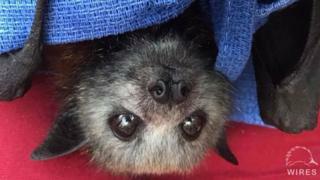 Another 120 flying fox pups were given water by rescuers and returned to their mothers. "Just like human babies, they're really vulnerable when they're young," said Wires rescue office manager Kristie Harris. Rescuers had also nursed possums with burnt paws caused by hot roofs and roads, and helped to rehydrate birds. "Any time we have any type of heat event, we know we're going to have a lot of animals in need," Ms Harris said.